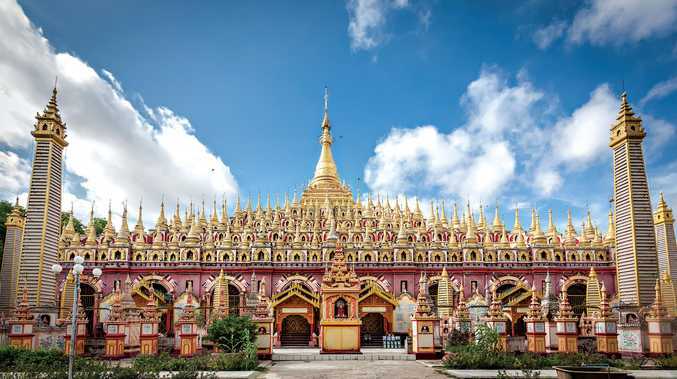 SPEND 13 days exploring the history and beauty of the Chindwin River in Myanmar as you sail past golden temples, quaint villages and sacred mountains. Highlights include a journey overland to Monywa and the colourful Thanboddhay Pagoda (pictured), a Buddhist novitiation ceremony at Mokehtaw, a tuk tuk excursion to the Buddha Lotus Garden in Homalin, and a tour of Mingun and the Mahar Min Kyaung Monastery. The cruise includes buffet breakfast and lunch, complimentary soft drinks, mineral water, local beer and free flow house wine (local and international) with lunch and dinner, internal flights within Myanmar between Yangon and the ship, a resident doctor, and all sightseeing on the itinerary. COSTS: From $9000 a person.